In this remarkable, expansive text, Peter Nolan explores the impact of the domineering economic phenomenon on our personal and social liberties. Since ancient times the exercise of individual freedoms has been inseparable from the expansion of the market, driven by the search for profit. This force, namely capitalism, has stimulated human creativity and aggression in ways that have produced immense benefits. As capitalism has broadened its scope in the epoch of globalization, these benefits have become even greater. Human beings have been liberated to an even greater degree than hitherto from the tyranny of nature, from the control of others, from poverty and from war. The advances achieved by the globalization of capitalism have appeared all the more striking, when set against the failure of non-capitalist systems of economic organization. However, capitalist freedom is a two-edged sword. In an epoch of capitalist globalisation, its contradictions have intensified. They comprehensively threaten the natural environment. They have intensified global inequality within both rich and poor countries, and between the internationalised global power elite and the mass of citizens rooted within their respective nation. 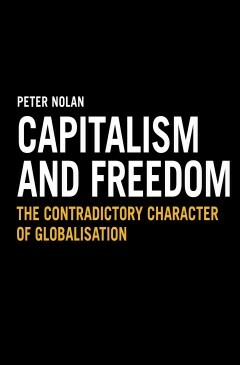 In this remarkable, expansive text, Peter Nolan explores the impact of the domineering economic phenomenon on our personal and social liberties. Peter Nolan is Sinyi Professor of Chinese Management at the Judge Institute of Management, Cambridge University, and Fellow of Jesus College, Cambridge University.